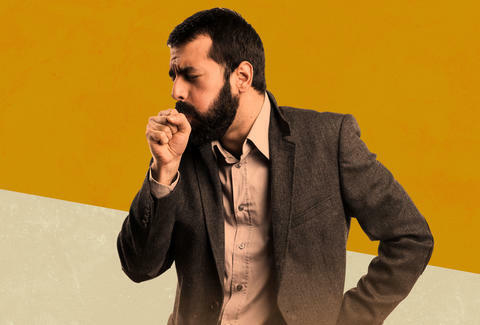 Having a cough is annoying, not just for you, but everyone in your open-plan office who wishes you would shut up. It's a malady that isn't quite bad enough to justify a visit to the doctor, but is still disruptive to your daily activities. It should go without saying (but obviously doesn't!) that if you have green mucus coming up, nausea, heartburn, trouble breathing, or pain when swallowing, something more may be going on, and you should probably head to a doctor. If it's your run-of-the-mill cough with a side of cold, though, the basic mom advice still applies: Stay or go home, get some rest, have soup for lunch, take a hot bath, drink some tea, and don't talk. Seriously. Be quiet. Then try a few of these cures. Most people don't drink Robitussin for the taste, and, as it turns out, a major review of the effectiveness of over-the-counter cough medicine found that there's no good evidence for or against taking it. We just don't know! That's kind of concerning for medicine that's been sold for decades to clueless consumers who happen to trust the claims made by cough medicine… probably because these meds are supposed to get rid of a cough. While there's no shortage of specialty cough drops on the market, the good stuff is actually found in a zinc lozenge. "Zinc lozenges have been shown to be effective against the common cold, and various studies have supported their efficacy over placebo in reducing the duration and severity of symptoms," says Columbia University Medical Center's Dr. Jason Moche. Switch up your drugstore routine and go for the zinc, which is pretty similar to a cough drop anyway. Honey has a good "demulcent effect," which soothes the membranes in your throat that are flaring up. While warm tea and honey sounds like advice that's more placebo than actual cure, honey actually does work better than traditional over-the-counter meds when it comes to coughing. If you're looking for a bit of an extra boost, try manuka honey. You won't regret it. While its name suggests a remedy for an entirely different problem altogether, passion flower has been shown to help relieve coughs. It's been widely used in herbal medicine to treat anxiety and sleep problems too, and there's some evidence that it actually helps with the latter. So if your cough is keeping you up at night, try some passion flower tea -- you can usually find passion flower supplements and extracts in the vitamin and supplement aisle of a drugstore. Your best bet is to make a tea out of this one: It will coat your throat and protect your now-sore and very delicate throat tissue. Licorice root has a stronger antitussive effect than codeine, which is often weirdly prescribed for serious coughs. If tea isn't your thing, you can also find it in capsule form. Candy licorice doesn't count, by the way. Sadly, this isn't the kind of marshmallow that you buy in a store and roast over an open fire, though the modern version is based on a candy made from marshmallow roots dating back to the ancient Egyptians. One of the benefits of the candy in those days was that it was purported to have medicinal properties, and the root does have some cough-stopping benefits. Just don't try to roast it on an open fire. Helaina Hovitz is a writer who doesn't plan on coughing at all this winter. Follow her @HelainaHovitz.